Happy Sunday! The Soap & Clay family spent the weekend at the Momtrepreneurs Event at Tacoma Freighthouse Square, and we had a grand time. I really enjoy booth events because I have the opportunity to hang out with the locals that come out to support our little businesses. I also love getting to catch up with my fellow makers on the circuit and see what new creations they’ve come up with since I’ve seen them last. 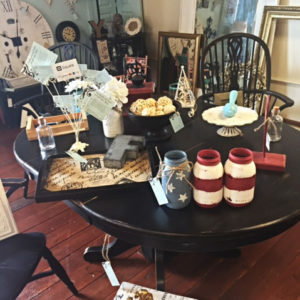 A number of my faves were in attendance, including Chris from Country Home Furnishings, whose repurposed and refurbished pieces never miss the mark. 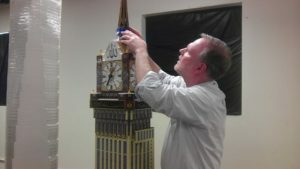 His attention to detail is exquisite, his prices are fabulous, and his setup is always on point (and all for sale!). Also in attendance was the lovely Brittany Jurgens, a Direct Sales pro who has recently taken the plunge into the artisan world. 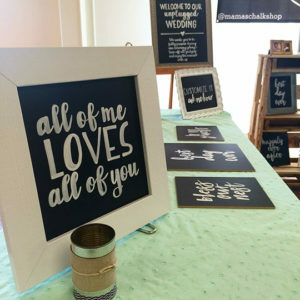 Her new business, Mama’s Chalk Shop, centers around adorable, custom made chalk signs. 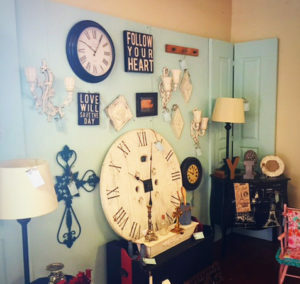 Her prices are great, her items are beautiful, and she can custom make anything you could possibly want on a chalk sign. I’ve already commissioned a few pieces from her for my booth signs, and she took my high-maintenance custom needs in stride. She launched her website the day before the event, which is pretty impressive in and of itself! Head on over to her page and give her some love! For my part, I said goodbye to a few old product lines (I’ll miss you, Game of Soaps!) 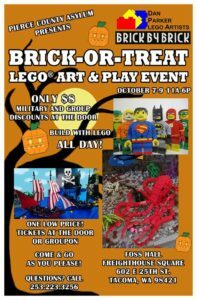 and added some new ones to the lineup for this event. I will be working on getting said new products on the site this week, starting with the topic of today’s post, Rubber Ducky, You’re the One! 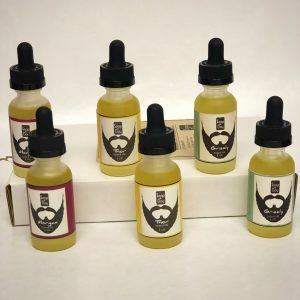 Read on for more information, then make sure to head over to the site and get yours! 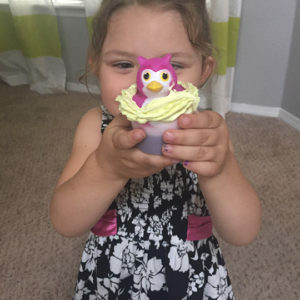 Rubber Ducks + Awesome Soap = The NEW Ultimate in Bathtime Fun! In the Soap & Clay Kids Line we have bath bombs, which are awesome. We have soapy balls Bubble Baubles, which are also awesome. 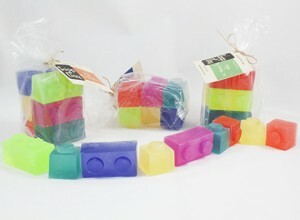 We have Lego Soaps – again, awesome. And then we have…Soap Tarts. Which are okay – they smell nice, they effectively cleanse skin without drying out our precious littles, and they’re gentle enough to be used on the mini-est of minis. But they’re kinda boring. When the Soap & Clay girl-children were helping me choose toys to put into a batch of Bubble Baubles, my 3 year old was drawn to a giant box-o’-rubber ducks. She’s an obsessive collector of all things (stickers, blind bags, rocks, random scraps of paper), so I braced myself for the mommy can I please have a bajillion rubber ducks query. Instead of asking for herself, however, she surprised me. Kids do that. She thought rubber ducks would be a pretty great addition to S&C Kids, and I agreed. Abandoning our mini-fig search, I grabbed the box and we giddily began planning our next adventure in soaping. 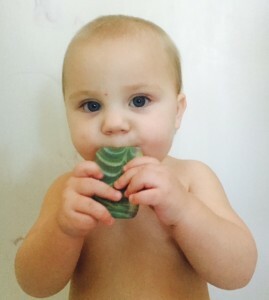 The shape of the Soap-Tarts was a great starting point; they were already the perfect size for smaller hands. The formulation of the Soap-Tarts was also great; this recipe was designed to be mild enough to use on newborns but effective enough to ensure an easy clean every time. So I made a batch and cut the discs thicker than the original to support the ducks and ensure longer tub life. 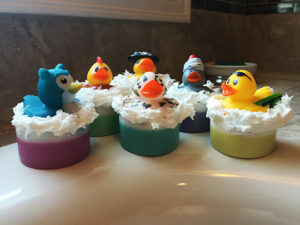 I then used the cream soap I usually reserve for my cupcake bath bomb tops and piped the ducks into place. The result? The cutest soaps I’ve ever seen! 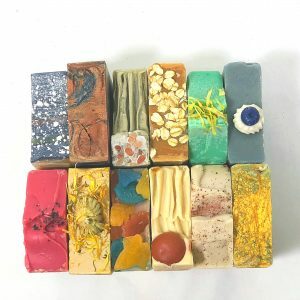 These soaps are perfect for tub time, make great gifts, and have become my most requested baby shower and birthday party favor items. The girls had a ton of fun selecting the perfect ducks to put on each disc, and while they were helping they named each and every one. They’re very excited to see No-Beard, Peppa, Cuppie and the rest of the gang go to their new homes, so I’m giving them away for a week! Enter coupon code GOTANYGRAPES at checkout to get a free duck soap of your very own. Coupon code expires Sunday, July 17th 2016. 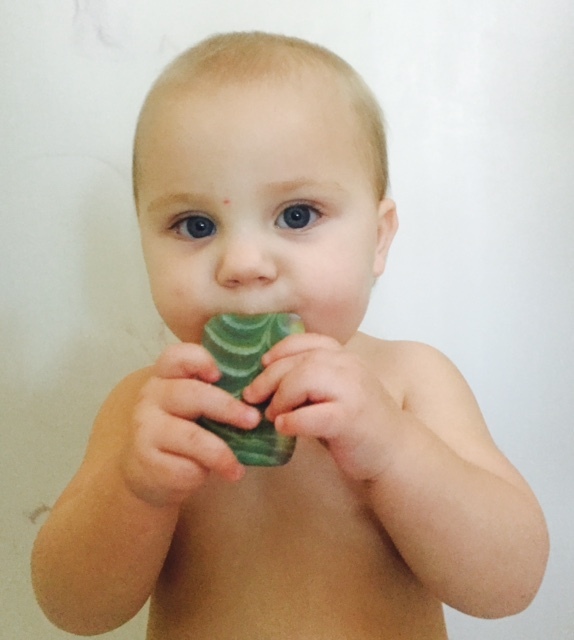 Fun Soap + Clean Kids = Happy Parents! It’s Sunday, which means another Game of Thrones episode, work tomorrow, and this week’s Soap Case. On the agenda today: Bubble Baubles! 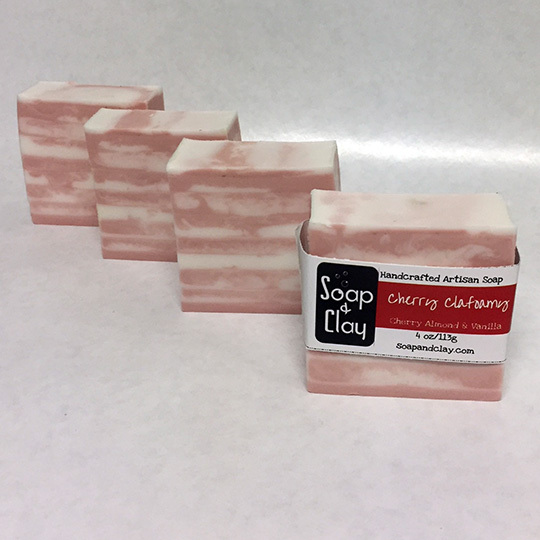 Read on for more information about a new twist on an old Soap & Clay product. I’ve noticed a trend in kids products lately. Well, maybe it’s not a new trend; I am a mother of monsters children under four, so my reintroduction into the world of tiny humans is fairly recent. But I seem to remember a lot more toy prizes when I was growing up. Bought a box of Cheerios, got a mini-terrarium. Bought a mystery novel, got a secret decoder ring. Bought a box of Cracker-Jack, got some 3D glasses. I just don’t see this anymore! We go through a lot of cereal in this house, and I can count on one hand the number of times General Mills felt the need to hook me up with some swag for choking down a bowl of Wheat Chex. I have to download an app, and then give my child control of my iPhone? Umm…no. 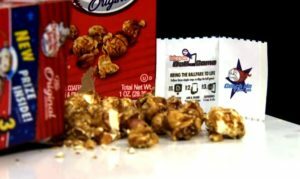 Even Cracker Jack, which you only purchase for the toy because the popcorn tastes like stale garbage, has moved from prizes to digital codes (which my children proceed to shred into a thousand pieces and call confetti). What gives? It’s not like kids don’t appreciate the thrill of the unknown that comes along with toy prizes anymore; surprise eggs, blind bags, and Kinder eggs show that in spades. 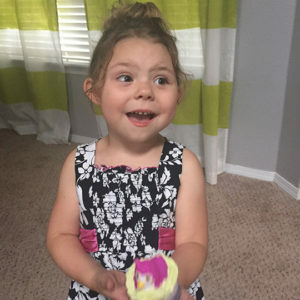 Just last week my three year old was walking beside me in the grocery store, examining a pack of socks while pondering “I wonder what’s inside? Maybe a new Slime-ball!” Kids LOVE surprises, even in socks. Side note: if this soap thing doesn’t work out, I am going to let her start her own YouTube channel devoted to opening up random bags o’ stuff. She’ll make a killing. Grown-up merchandise often comes with prizes – you can buy a freaking candle with a freaking ring inside of it, for crying out loud. So in an effort to put an end to the anti-prize madness, I decided to take a suggestion from my coolest Mini-Sudser of the male variety (my awesome nephew Liam) and play with embedding toys into soaps from the Soap & Clay Kids line. These orbs have been a site offering since I started the company, and they’ve been fairly popular. I did have a few problems with them, however. One: the name. 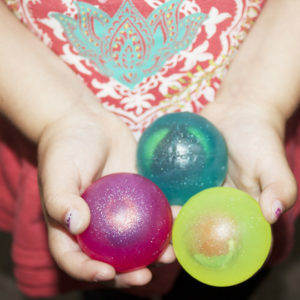 These brightly colored beauties started out as Super Soapy Bouncy Balls, which of course confused customers. Do they bounce? I played around with wrapping the soaps in rubber so they would bounce, but it was a phenomenal pain, not very eco-friendly, and had the potential to anger a boatload of parents after their kids hurl them through a wall in an attempt to make them bounce across the room. I had a difficult time renaming them; they went to Soapcraft: the Minecraft Edition for a bit, but selling orbs for a cube game didn’t make much sense. Problemo Numero Dos: they’re just round soaps. I mean, the soap itself is GREAT. It’s lather-riffic, smells amazing, and has a tub-load (a little soapy humor) of glycerin. 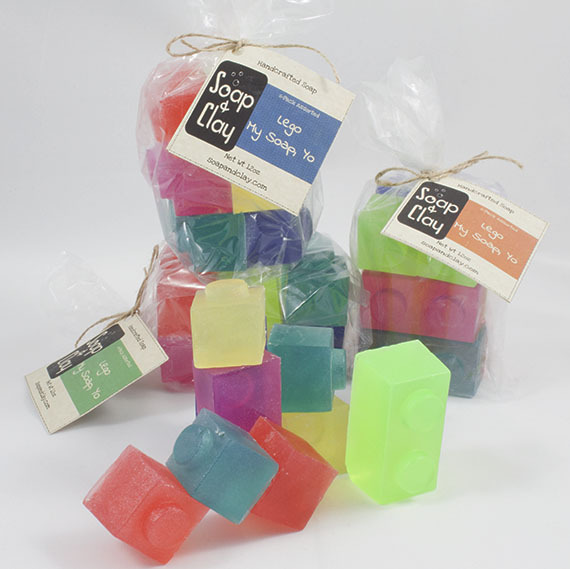 Glycerin soap is great for young skin – it keeps the skin moisturized, smooth, and germ-free. But all of my soap does that, so what makes this kid-specific product any different than the rest of my lines? Toys. Because, toys. Each orb is now filled with an adorable collectible – consider it a prize at the end of a successful soaping regimen. Each soapy ball is roughly 2 ounces and will last a few weeks in the bath or shower – it can last several months as a hand washer at the sink! Each time your kiddos use it, they will get a bit closer to their prize. Kinda like a Tootsie Pop, but without the cavities. 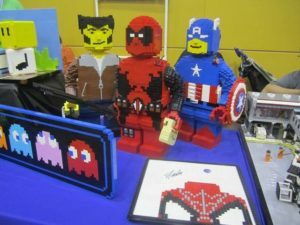 The toys run the gamut of all things fun and weird – from animals to footballs to miniature play food and superheroes – there’s a lot of variety. 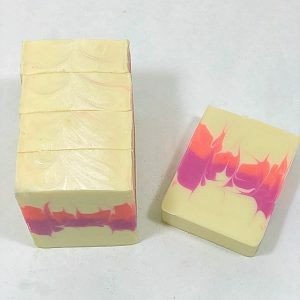 And, as always, the soap itself is bubbly and ultra cleansing and is scented with Soap & Clay’s signature Soda Pop Shoppe line. 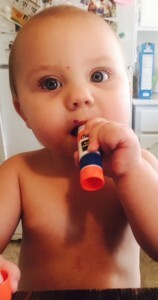 Great soap, fun toys – what more could you ask for? And to celebrate the new addition to the line, I’m giving them away! 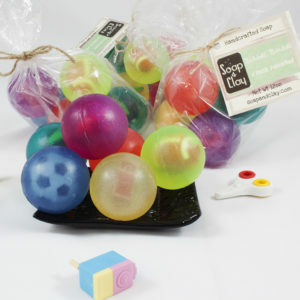 Enter coupon code SOAPYBALLS with your next order to receive a free set of Bubble Baubles. Offer good through Sunday, June 19th. 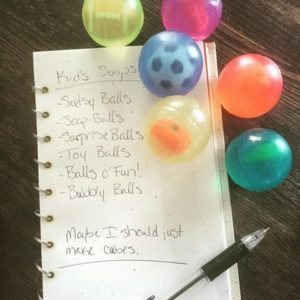 Soapy balls. I am a child. And I’m basically fine with that.